We contract this series of variables manufactured. 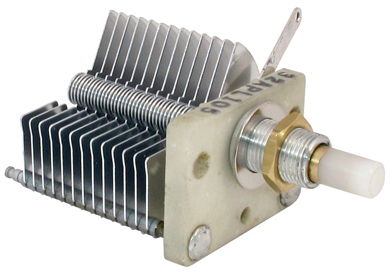 All units are 2-1/2" wide, 2-1/2" high, have a 1/4" shaft and mounting feet per picture. Production quantities available. Air variables with break away plates to easily reduce range. 3/16" diameter slotted shaft long enough for a knob. Panel bushing mount. Air variables with silver plated machined plates. 3/16" shaft. 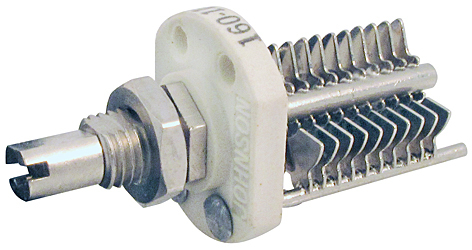 Panel bushing mount. 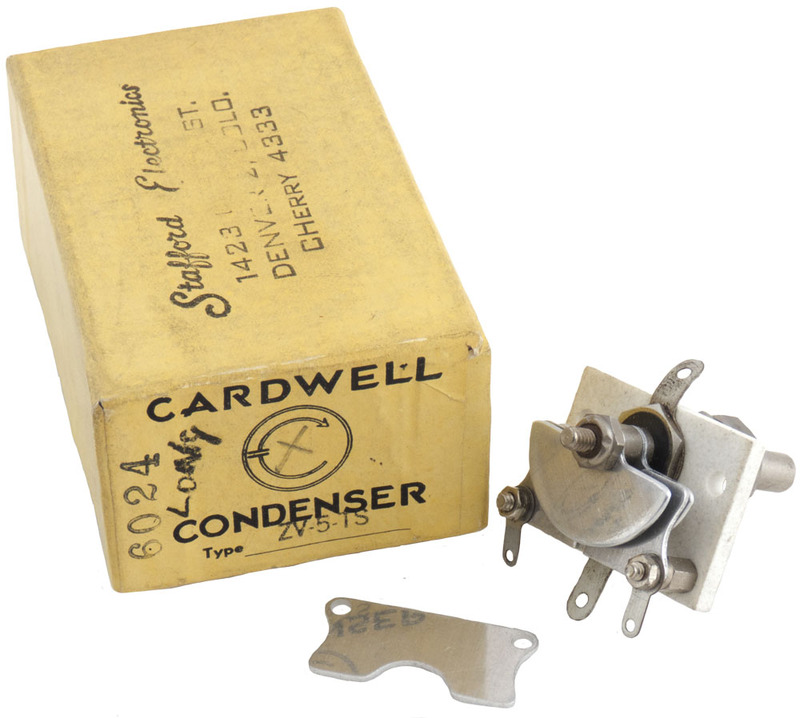 Cardwell air variable capacitor. 1.1-4 pF @ 5 kv. 0.140" gap. 1-3/8"W x 2-9/16"L x 1-1/8"H. 1/4" shaft. 1/2"L with locking nut. Alt P/N: PL6022. 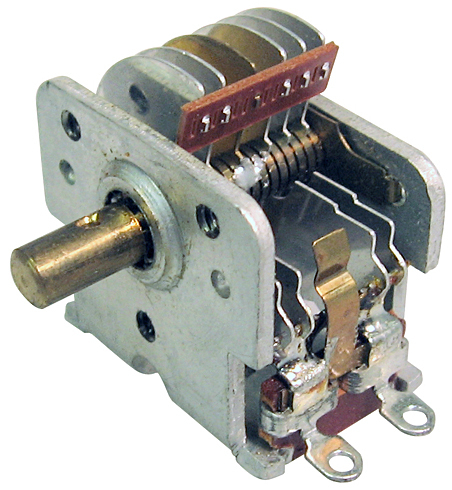 Johnson air variable trimmer capacitor with coil attached with 4 turns. 1.8 - 8.7 pF @ 1250v. 9 plates. 3/16" shaft. "LC" network. 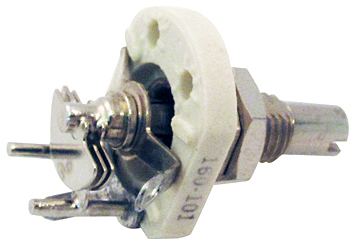 Johnson air variable capacitor. 1.8-8.7 pF @ 1250v. 9 silver plates. 3/16" shaft. 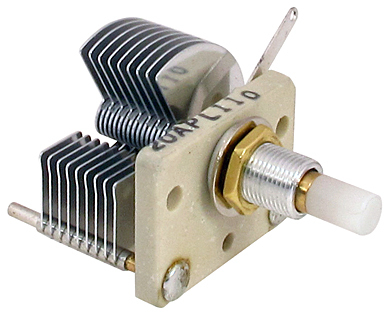 Cardwell air variable capacitor. 2-7 pF @ 5 kv. 0.140" gap. 1.4"W x 1.13"H. 2.06" behind panel depth. 1/4" x 1/2"L locking shaft. Alt P/N: PL6023. 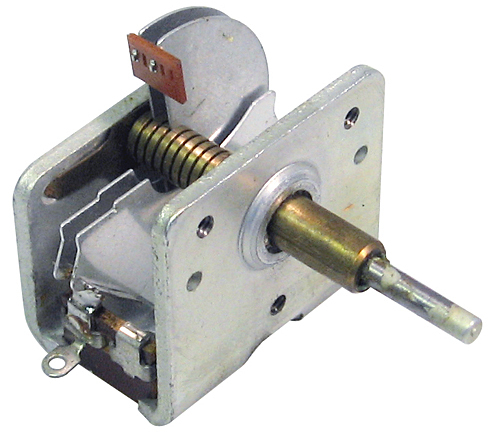 Johnson air variable trimmer capacitor with coil attached with 3 turns. 1.8 - 8.7 pF @ 1250v. 9 plates. 3/16" shaft. "LC" network. Nifty variable with built-in vernier ball drive. 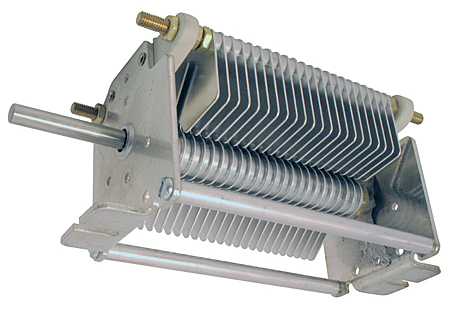 2 kv plate spacing. 1/8", 1/4" shafts. Mounts by end plates. 1-3/8" x 1-3/8" x 1" deep. Knob set $8. 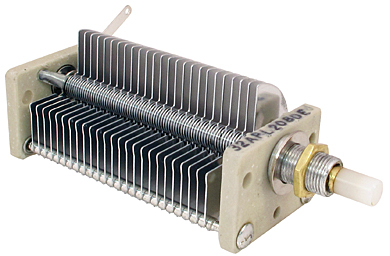 Air variable capacitor. 2.5 - 15 pF @ 1250v, 1/4" shaft, break away plates, bushing mount. 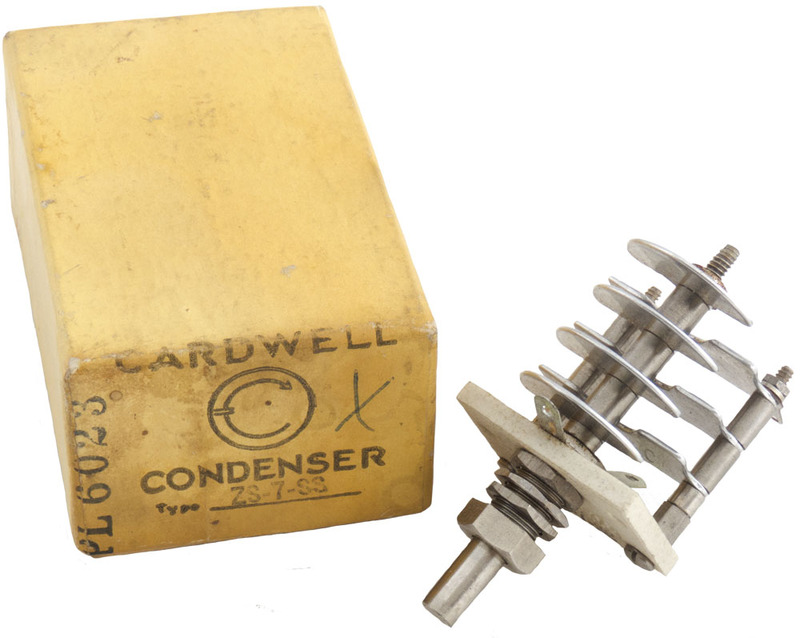 Cardwell air variable capacitor. 3.6 - 11 pF @ 3kv. 0.07" air gap. 1/4" x 1/2"L shaft. Front bushing mount. 1-7/16" x 1-1/2"H. 1-3/8" behind. Alt P/N: PL6010. New! 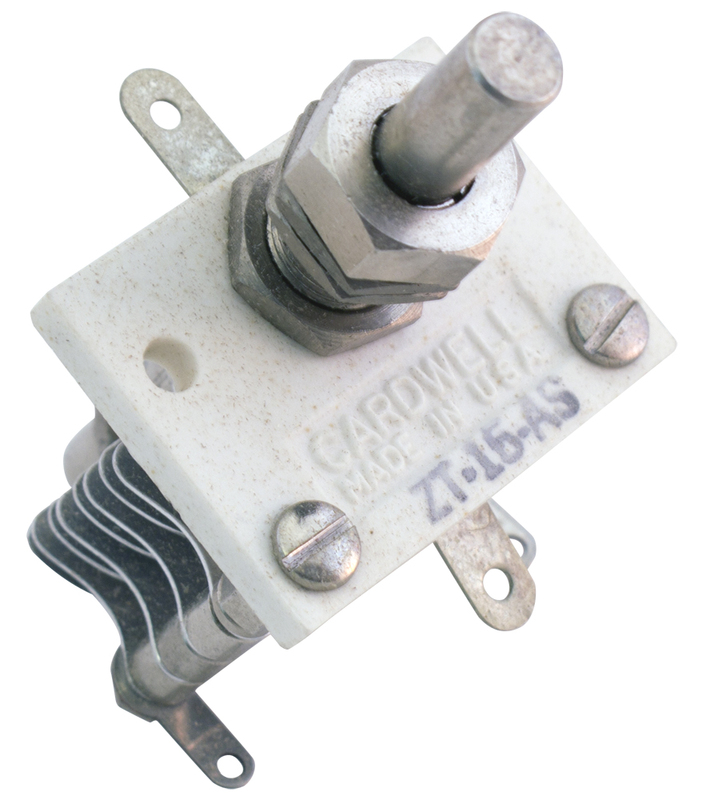 Cardwell air variable capacitor. 4 - 16 pF @ 3kv. 0.07" gap. Front bushing mount with lock nut. 1/4" x 1/2"L shaft. 1-7/16" x 1-5/8"H. 1-5/8" behind. Alt P/N: PL6011. New! 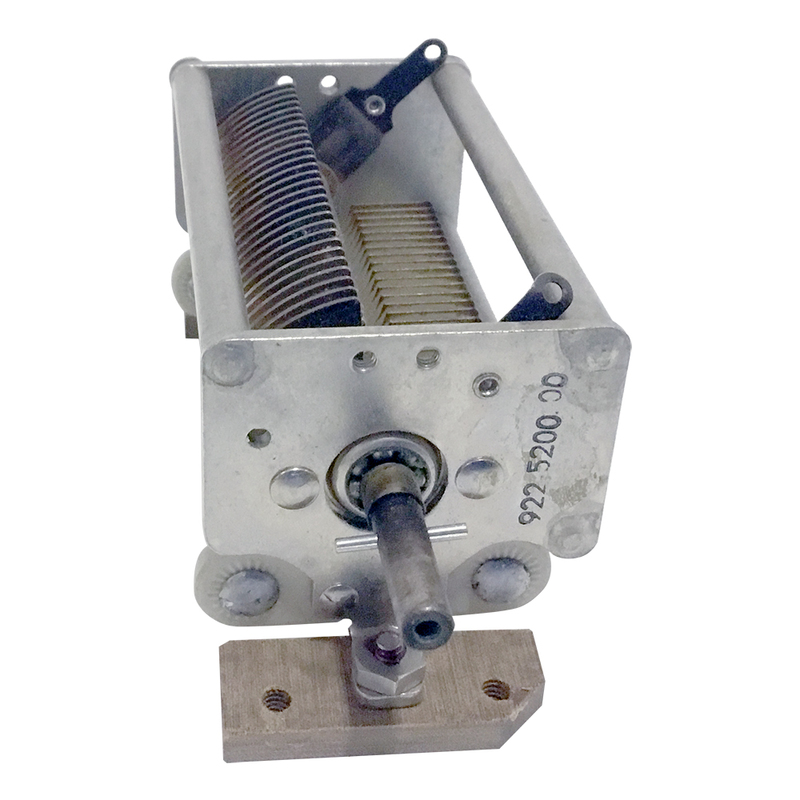 Air variable capacitor. 4 - 25 pF @ 1500v. 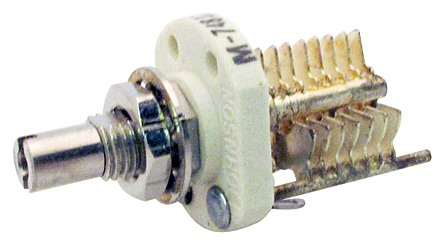 Front 2 hole mount, 1/4" shaft, 3-1/2" long. 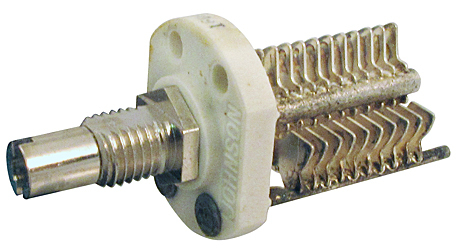 Air variable capacitor. 8 - 27 pF @ 1000v sections. 3/16" x 3/8" long shaft. Front panel has three #6 tapped mounting holes. 1-1/2" wide x 1" high x 3/4" deep. 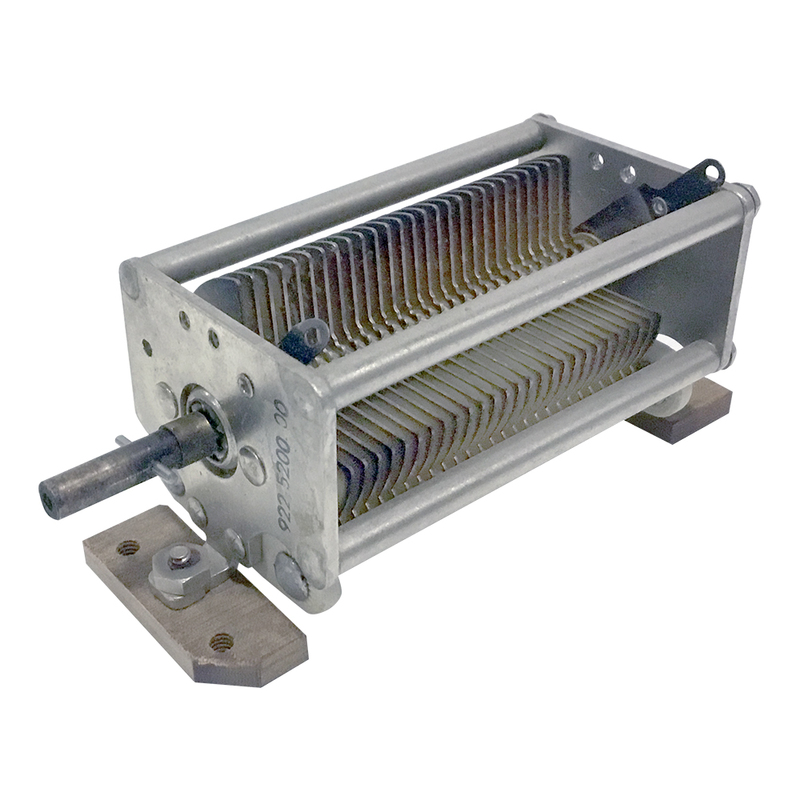 NOTE: Rotor plates short to stator at maximum capacitance. Short can be defeated by bending brass strip away. 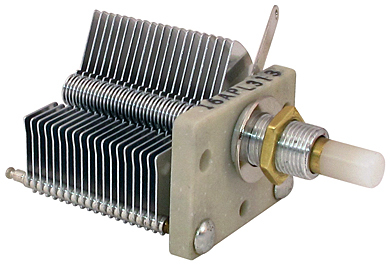 Air variable capacitor. 4 - 50 pF @ 600v, 1/4" x 1/2" long shaft. 2 hole APC mount. 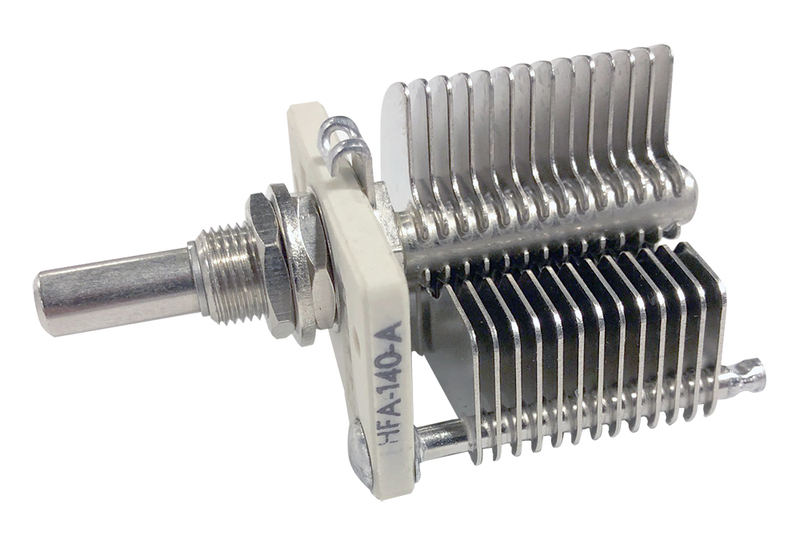 Hammarlund air variable capacitor. 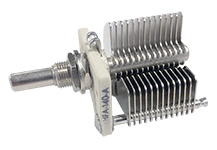 3.4 - 60 pF @ 600v, 1/4" x 1-1/8" length shaft. Bushing mount. 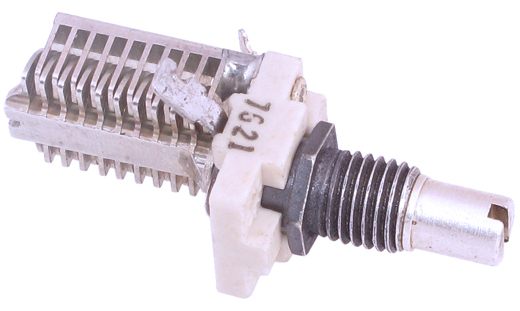 E.F. Johnson air variable capacitor. 7.5 - 99 pF @ 500v. Mounts with two #6 thread screws. 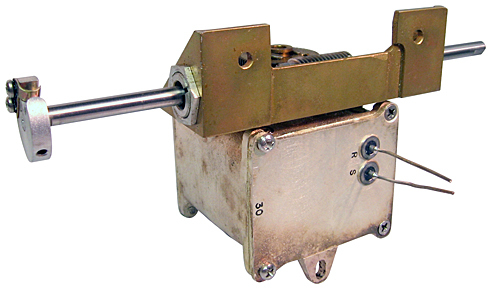 APC style with 1/4" x 1" long shaft. 15/16" x 1-3/16", 1-5/8" behind panel depth. 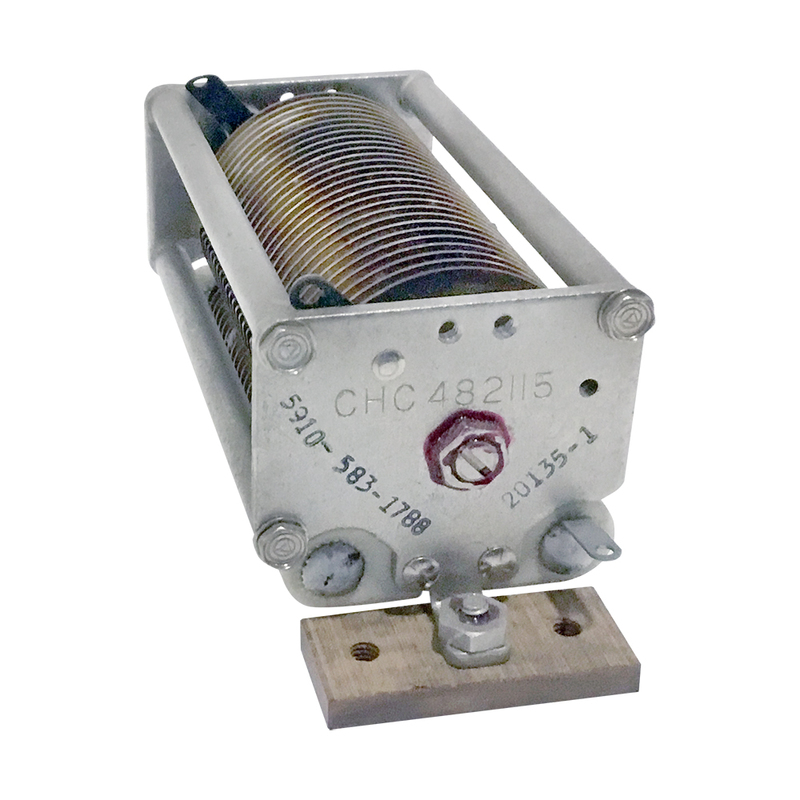 Receiver dual section air variable capacitor. 10-100pF and 10-130pF. Brass body, ball bearings. 3/16"D x 1/4"L "D" shaft. 1-1/16" x 1-1/16" x 1". Vintage stock from Fistell's stash - 1970's. 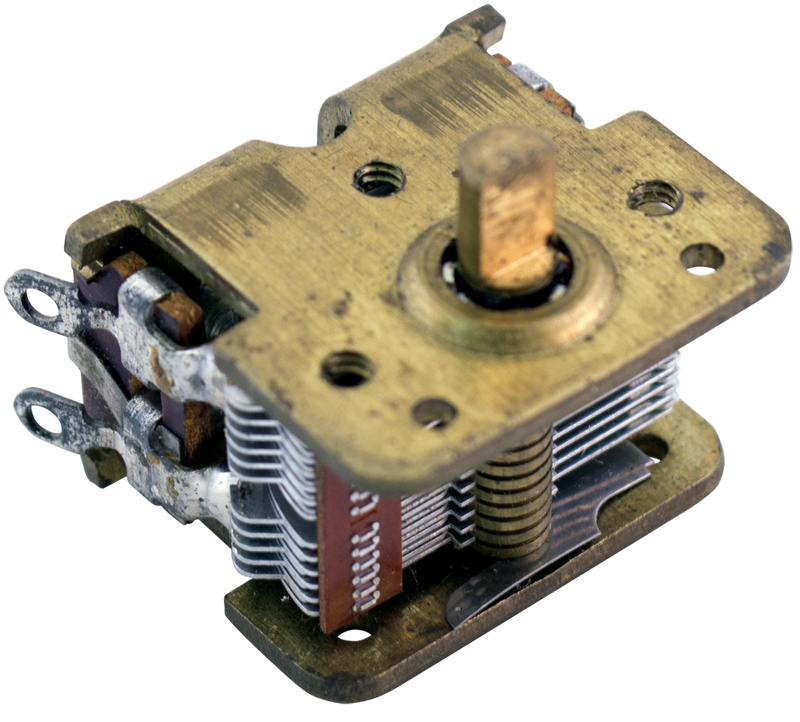 U.S. made air variable capacitor. 8.7 - 106.2 pF @ 1070 vrms. 26 plates. 0.032" air gap. R = 1-9/16". 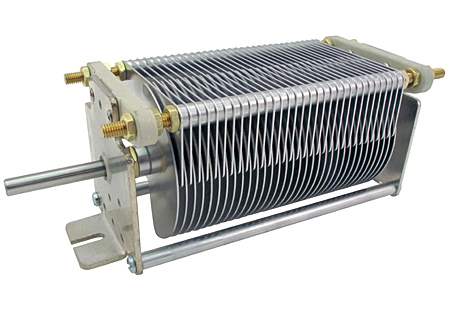 Air variable trimmer capacitor. 5.9 - 111.1 pF @ 800v RMS. 18 plates, 0.020" spacing. 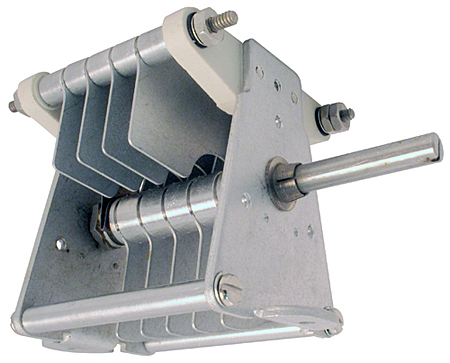 Hammarlund air variable trimmer capacitor. 6 - 145 pF @ 1.1kv. 1.7" behind panel depth. 1.405" wide. 1.3" high (with rotor @ 180º). 3/8" bushing mount. 1/4"D x 0.562"L shaft. 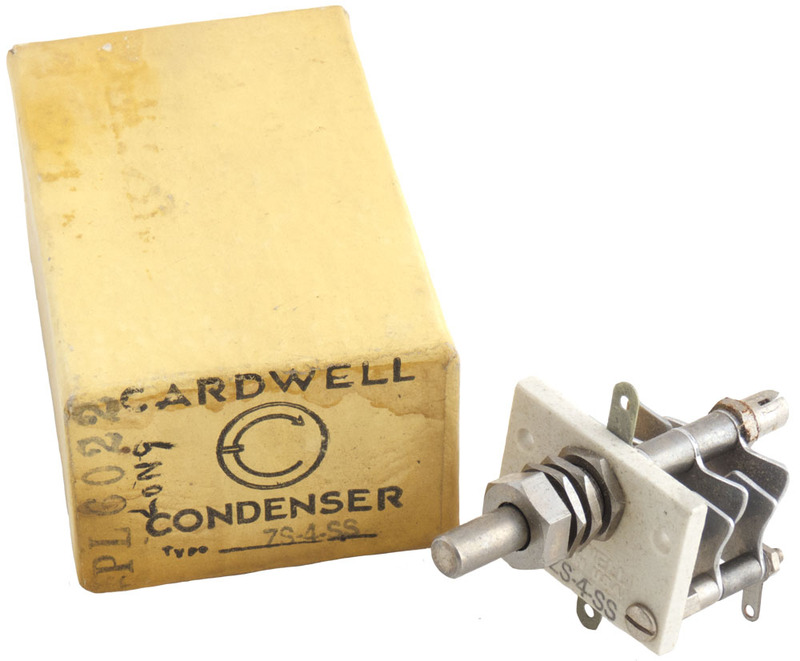 Cardwell air variable capacitor. 5 - 146 pF @ 800v RMS. 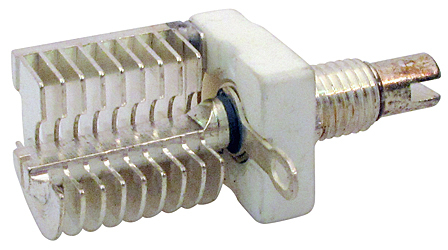 Single section with slot adjust and lock nut. 27 plates, .020" plate spacing. 1-3/4" behind panel depth, 1-3/8" width. Nickel plated copper. New old stock in original box. 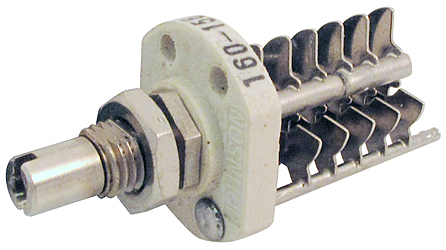 TMC air variable capacitor. 21 - 220 pF @ 1500v. 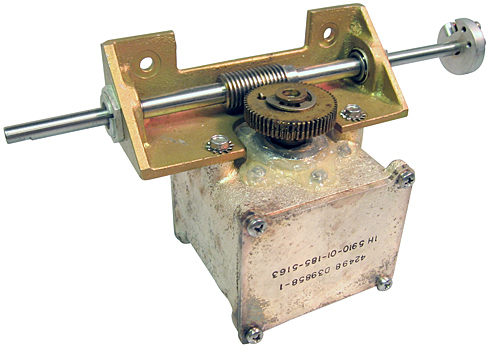 1/4" shaft, right angle & anti-backlash gear. 4.5"L x 4.5"W x 3.7"H. 0.31" shaft off end of cap to series drives another cap. Made like a fine Swiss watch. Original government cost = $5,500. 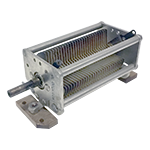 U.S. made air variable capacitor. 16 - 208 pF @ 1070 vrms. 50 plates. 0.032" air gap. R = 2-25/32". 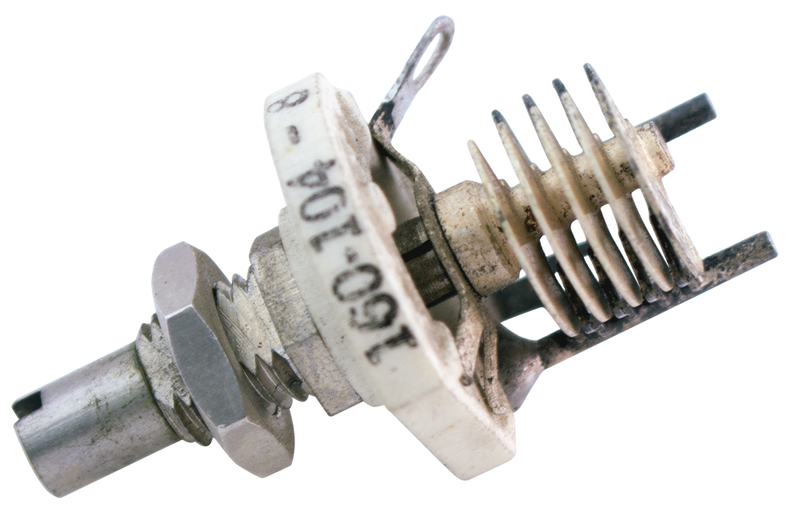 U.S. made air variable capacitor. 10.5 - 314 pF @ 640 vrms. 39 plates. 0.016" air gap. R = 1-9/16". 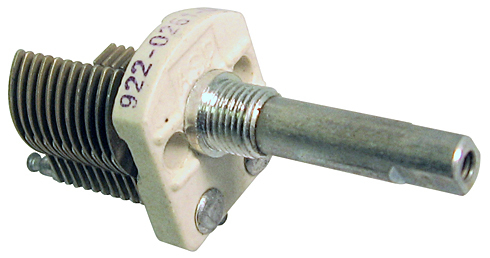 Air variable capacitor. 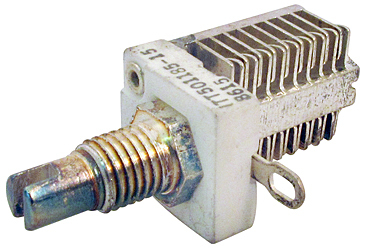 20 - 440 pF, 500v. Silver plated. 4-1/4" x 1-3/4" x 1-7/8"H. 0.218" x 0.9" shaft. 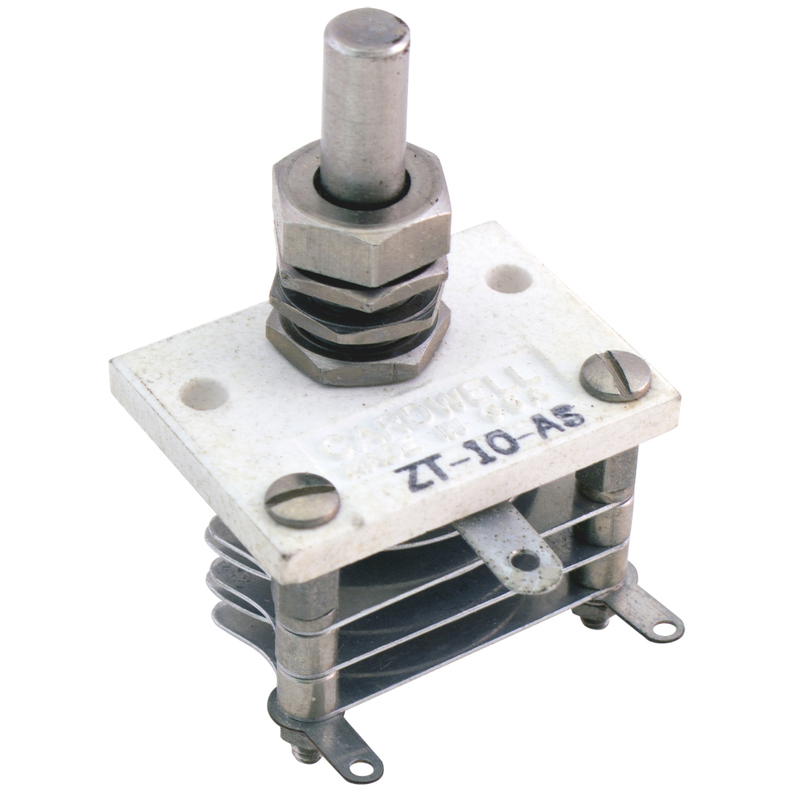 Air variable capacitor. 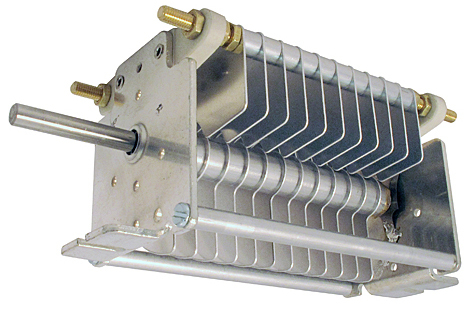 21 - 820 pF (UUF) at 1kv. 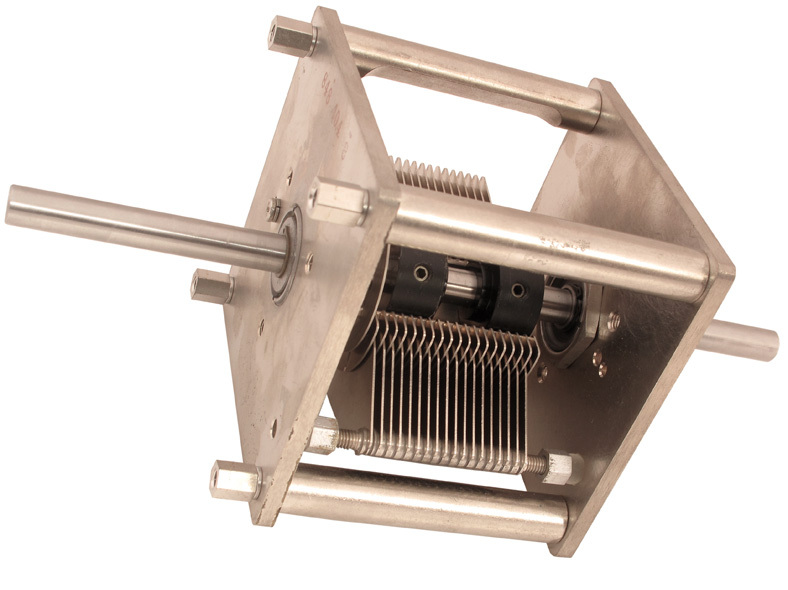 4"L x 3-3/4" sq body, 3/8" diameter shaft extends 2-1/4" beyong body on each side. Extremely loose bearings suggesting a geared or motorized connection. Government cost: $1,700. NSN: 5910-00-410-1316.